It’s hard to keep track of everything new in content marketing, especially if you consider that 91% of B2B marketers and 86% of B2C marketers indicate they are using content currently as part of their overall marketing strategy. There are many articles with best practices, proven strategies, and statistics. But there’s one thing that can beat them all: Clear, actionable, real-life examples. But good content marketing case studies with excellent results can be hard to come by. That is why in this blog, we’ll cover five extremely successful content marketing case studies including the tactics used, results measured, and why it matters to you as a marketer. 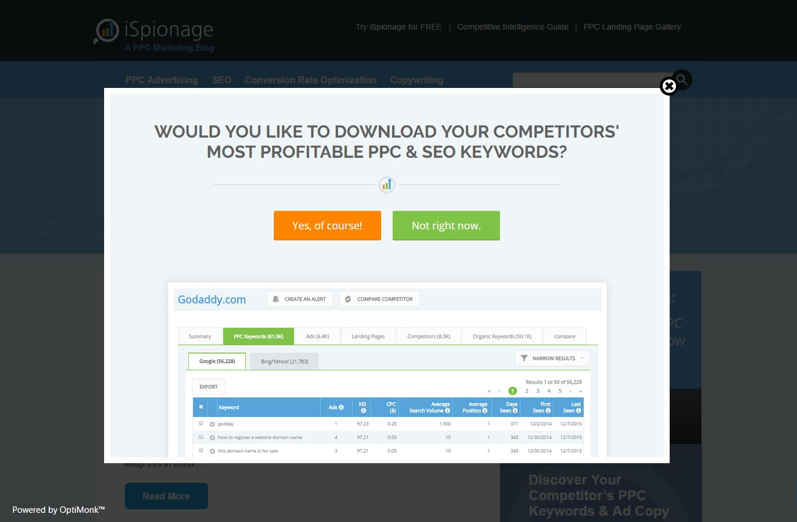 The growth hacking tool iSpionage runs a pay-per-click marketing blog. By investing in content marketing, they had hoped to capitalize on additional visits. But despite publishing new articles regularly, they weren’t seeing a lot of referral traffic towards the main website. In this case study, they explain how they managed to increase that traffic by 58.09% in just one month by using an exit intent popup. Tactic: Onsite retargeting with an exit intent popup. By simply asking a yes/no-question, people answering “yes” were redirected to another preferred page. 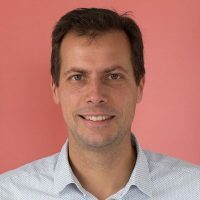 As soon as blog visitors showed an exit intent, or behavior indicating they were about to leave the page, they got redirected to a page containing content they might be looking for. Results: 5.47% CTR on their retargeting ads & 58% increase in blog referral traffic. Why this matters: iSpionage knew what the majority of their visitors were looking for: to download competitors’ keywords. So that’s what they asked in their exit intent popup. Additionally, to avoid cold leads, iSpionage made use of some well-timed triggering. They only let the popup appear to visitors who had spent at least 10 seconds on the blog, making sure their conversions were coming from an engaged audience. When the Game of Thrones series was in full swing, it generated huge buzz online. Lawrence of Morocco, offering tailor-made holidays, took advantage of this as much of the series was filmed in Morocco. By creating related content linking back to their product offering, they generated tons of extra traffic to their website. Tactic: Creating one flaming-hot piece of content that is extremely shareable. 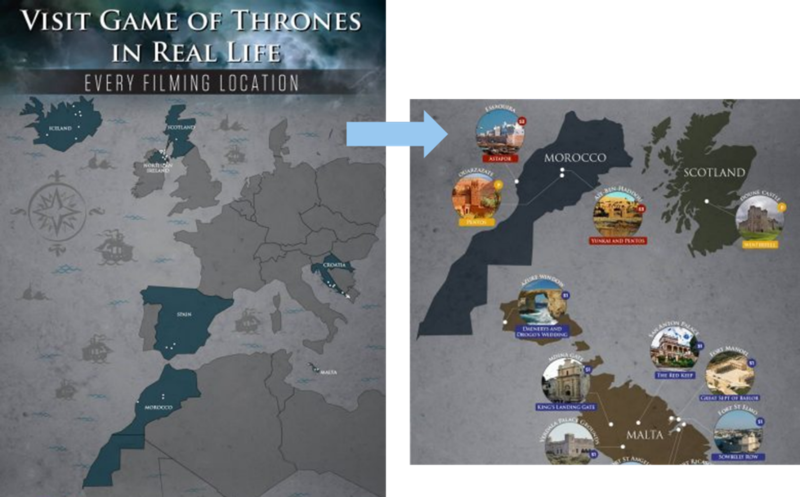 SEOTravel did so by creating an infographic-style map, indicating every single real-life location where the popular TV show was filmed. Sending this to Game of Thrones-hungry journalists made it spread like wildfire! Results: An increase of 11K+ website visits in just two weeks, with 12 continuous days of all-time high traffic. Coverage in big media outlets like the Washington Post, Mashable, Business Insider, … And more than 100 new domains linking to their site. Why this matters: SEOTravel managed to jump onto a very popular topic and create relevant content for Lawrence of Morocco’s audience. Their smart outreach made the piece successful. They gave the map as an exclusive to a single media outlet, and as soon as it was online, they created additional buzz by reaching out to geekier outlets. These generated a lot of shares initially, which could then be used as social proof to tackle larger media outlets. Extra insider tip: If you don’t manage to get an exclusive with one source, it’s likely your content isn’t up to par just yet and won’t generate the buzz you expect. In this content marketing case study, YesOptimist helped a startup, CollegeRaptor, to get from absolutely no organic traffic to 100K visitors per month in just one year. They created a highly relevant piece of content using nothing but publicly available data which was picked up by several big blog sites, giving them the initial boost in high-quality backlinks. Tactic: Generate links to the website to help improve rankings and search visibility. As College Raptor’s main focus is on matching students with the right colleges, their content should relate to that topic. 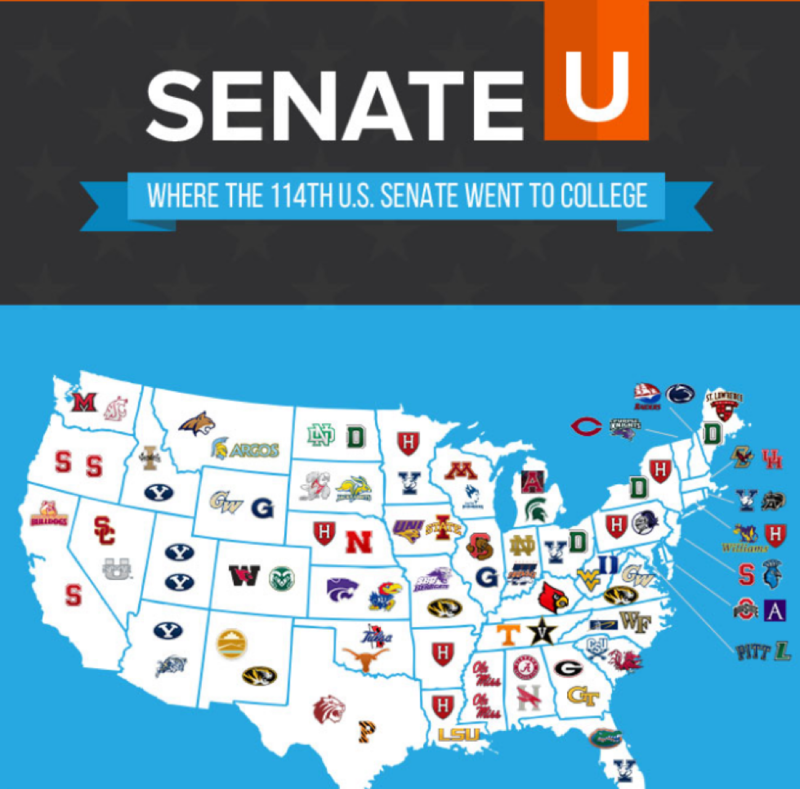 They simply searched Wikipedia for common information (where US senators went to college), did some analysis and compiled it into an infographic map which was sent to multiple outlets. Results: After being picked up by the Washington Post, dozens of other outlets started sharing: The Houston Chronicle in Texas, The Deseret News in Utah, Minnesota Public Radio, and Time magazine. The content was even cited for a U.S. Supreme Court case. Why this matters: This case shows us that you can create some content that delivers valuable insights with publicly available data. There’s no need to invest in expensive studies because there’s a ton of useful data out there that will allow you to create a wide range of content from infographics to deep research. Extra tip with this type of content: It doesn’t always have to be created for your primary audience. The real goal of College Raptor was to increase backlinks, which will result in building traffic to more relevant content for that main audience. LawnStarter is a company which focuses mainly on homeowners who are looking for professionals to take care of their lawns. The important lesson to learn from LawnStarter is that the most obvious content for your audience is not always what they care about. Tactic: Create content your audience actually cares about, even if it’s not entirely focused on your product or service. By doing extensive research to understand your audience, you can find more ways to reach out to potential customers by looking for influencers that your prospects listen to. These influencers, individuals, or blogs, can easily be researched to uncover what their most popular content surrounds. Results: Steady growth by building a relevant audience based on content that people WANT to read. Use your influencers wisely! For example, including quotes from influencers within an article can encourage them to share those pieces with their networks, increasing your reach without spending another dime. Why this matters: It’s less about how to make a boring subject interesting and more about finding interesting topics and angles to engage your prospects. A structured approach using tools that are readily available to back up your hunches with actual data will make this approach a dream for anyone who loves logical processes. Fieldwire, a web and mobile collaboration platform for the commercial construction industry, had a stronger focus on product and engineering but was lacking marketing-focused content. CanIRank helped them shift their focus from conversion to traffic generation and got them to rank in the top three search results for all their main keywords. Tactic: Boosting the most high-potential pages with data-driven optimizations such as what keywords were they ranking for. Based on currently used keywords, they created well-chosen content that toed the line between traffic value and ranking difficulty. They combined these tactics with influencer outreach campaigns varying from reviews, company profiles to founder interviews. All giving the new pages their initial boost. Results: These optimizations and new creations lead to higher conversion rates and additional search engine rankings. In just six months, they boosted all their primary keywords to top three positions, added 100 new keyword rankings, and increased 200 existing rankings. Why this matters: Before heavily investing in a sales- and marketing team, Fieldwire could use a couple of simple processes to move the needle. These initial efforts made them grow in all their marketing efforts and saved them over 10K in Google AdWords investments. While it’s easier than ever to generate new types of content, it isn’t always easy to find the right direction for your industry or audience. These very different cases show you how different approaches can help, even when the task seems daunting at first. 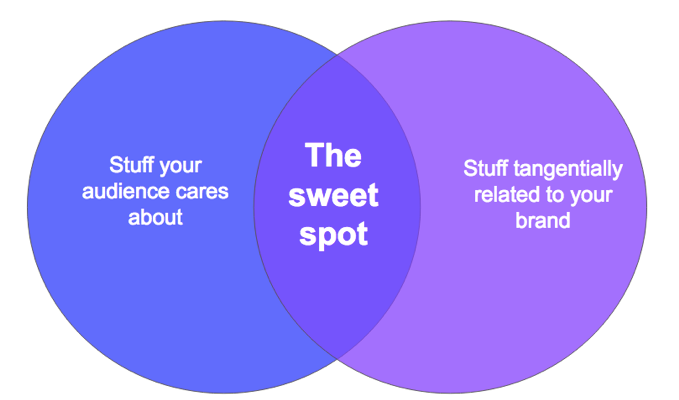 Which content marketing case study did you find most relatable? Tell me about it in the comments.